Keeping up the yard is a full time job, and most of us cannot afford gardeners. For safety's sake DO NOT allow any child under 14 years old to operate or play around a lawn mower. Instead, we enlist our children in the process. Lucky them. And lucky us! Getting kids to help with yard work is usually easier than getting them to help with indoor chores. Kids love to be outside. They love to play in the dirt. They love anything to do with squirting water. Some yard maintenance, such as mowing, requires no motivation. Kids love to handle anything that has a motor and the power to maim or kill them. Kids, especially boys, are born with a love of lawn mowers. They're big, they're noisy, they're dangerous - what more could a growing boy ask for? Here's how to bring kids and yard work together safely. Therein lies the problem. Adults, especially moms, don't like lawn mowers for precisely the same reasons. 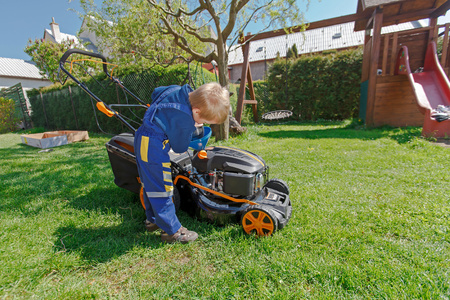 Therefore, it suits both parties if older kids do the mowing, as long as a few safety precautions are observed. No one under the age of 14 should handle a lawn mower, a weed whacker, a chipper-shredder, or other potentially dangerous, sharp-edged, debris-spewing machines. Or, for that matter, pruners and other sharp-edged garden tools. And parents should never take kids for joy rides on a lawn mower. It gives them precisely the wrong message. Mowers are not toys. Kids are apt to slip and fall under the blades. In fact, don't even let kids near when you're mowing because the mower could spit rocks out, or you could even accidentally back over them. Send the kids (and pets) inside while mowing. While you're mowing, set a safe example and always wear long pants, sturdy shoes (not sandals), gardening gloves , and safety goggles. And pick up some gear for the kids if they'll be regular helpers. Not only does it make yard work safer for kids, chances are they'll enjoy the gear as much as the dirty jobs ahead. And speaking of playing safe, one final rule to follow: Do not try to free objects that are stuck in the mower blade with your hand, even if the mower is turned off. There could be residual tension that will spin the blade once the object is removed. Parents usually like having a lush green carpet of grass for their kids to play on. But just make sure that that carpet isn't poisoning your kids (or pets). Some of the ways people grow such lush green lawns is with lots of fertilizers (to make it grow), herbicides (to keep out weeds), and pesticides (to kill bad bugs). Do you really want your toddler (who puts everything he touches into his mouth) playing on that bed of chemicals? If you buy the right kind of grass for your climate and garden soil, you'll have denser, healthier grass that will choke out most of the weeds. You can also weed by hand. Or you could plant a groundcover such as chamomile or creeping thyme instead of grass. Your call. One natural alternative to commercial herbicides is applying a layer of organic corn gluten, which keeps weed seeds from germinating. An organic alternative to fertilizer is simply leaving the grass clippings on the lawn after you mow. When the clippings decompose, they will return nitrogen to the soil. As I mentioned before, mowing is not safe yard work for small kids. Instead of mowing, there are other, safer, ways kids can help. Our job as parents is to figure out how to get them to help out with the kid-friendly aspects of yard work such as weeding, watering, or just picking up their bicycles. For example, after an adult or older kid has finished mowing, younger kids can help gather up the grass clippings and take them to the compost pile. Kids are also great at edging - using a spade and other kid-size garden tools - to outline a garden bed, driveway, or path. One of the hardest parts of lawn care is keeping it from taking over the driveway and sidewalks. This is a great chore for kids because they're low to the ground anyway. Another task kids can usually do is operate leaf blowers - and they usually love to do so! These are safe to use, but tell kids not to aim them at anyone - including the poor dog or cat! - and to wear a mask and ear plugs when using them.